Why Do I Need a Sunroom? What Makes Us the Leader? Protect yourself from the insects with the Ultimate Screen Room from TEMO. Our thermal roof shields you from the hot sun and our full screens let you enjoy both the view and the breeze on a beautiful day. 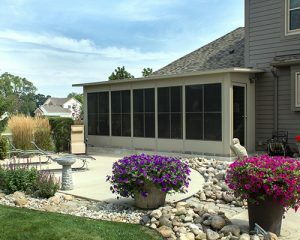 Even rainy days aren’t a problem with TEMO’s Ultimate screen room. While bad weather may keep you from enjoying other screen rooms, the Ultimate includes lightweight, removable vinyl sashes that provide wind, rain & UV protection when you need it. That means there’ll be more days when you can enjoy your screen room from early spring through late fall. The Ultimate screen room is designed to compliment every home. It is available in the Studio and Cathedral styles, in white or sandstone. You also have a choice of removable vinyl sashes, either large horizontal sliders or three and four light vertical sliders. A large 42 x 86 inch swing door gives you easy access to the inside. Our manufacturing process starts from the concept up. TEMO created the first thermally insulated roof and wall systems for sunrooms, and continues to lead the industry in engineering sunrooms, pergolas, screen rooms, patio covers, and more. TEMO has proudly designed a full line of patio product styles that offers homeowners the best available options. Each TEMO structure is individually designed to the exact specifications of the customer and blueprinted with the assistance of our state-of-the-art CAD computer system for precision manufacturing. Our structures come with a limited lifetime transferable warranty, which is the most comprehensive warranty in the industry. *Special Offers or Promotions: Any special offers, discounts or promotions ("Promotions") appearing on this web site from time-to-time may only be available for a limited time, are limited to one per household and are valid only for homeowners over 18 years of age. Minimum purchase amounts may apply, along with other terms and conditions, so please contact us for complete information or speak to your local Temo dealer's representative. Not valid in conjunction with any other Temo-related offer or discount of any kind. All Promotions are subject to change without notice. Not all Temo-authorized dealers participate in Promotions, so depending on the Promotion, please check with us or your local dealer for more information. Promotions are void where prohibited by law or regulation and have no cash value.